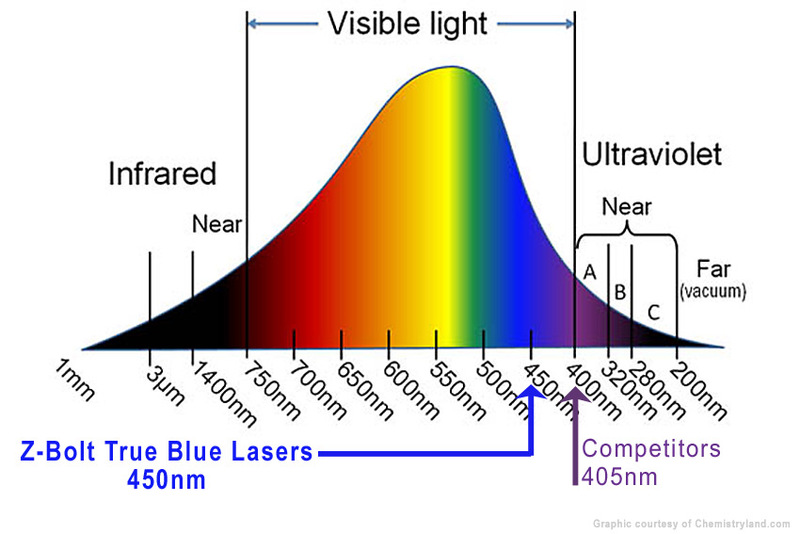 The BLP-5 is a true blue 450nm blue laser light, not 405nm violet/purple. Projects a brilliant sapphire blue laser beam and dot. Silver or black tube. Nylon lanyard & accessory end cap; gift case. Free Text Engraving:Engraving Instructions Here, Quick 24 to 48 hr Turnaround! 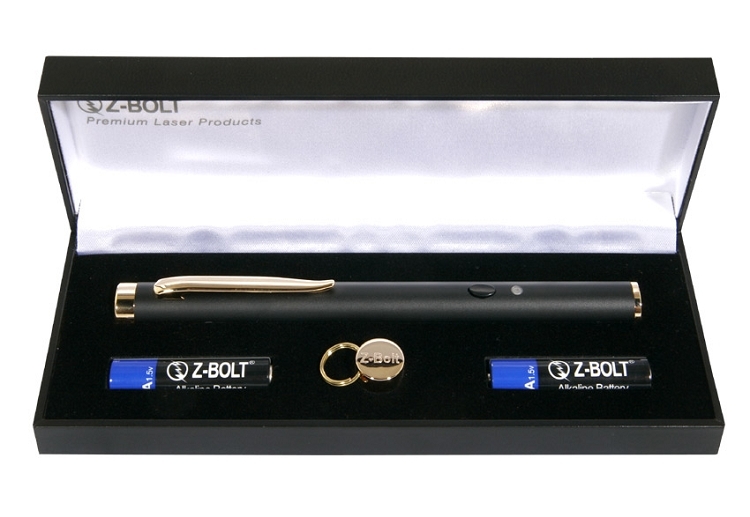 The Z-Bolt® Sapphire Presenter (BLP-5) is very cool. We have placed our new design blue laser diode in a beautiful casing suitable for an executive presentation or gift. Don't brief with green - be the first in your office - go true blue! The BLP-5 features true blue 445~455nm blue laser light (not 405nm violet/purple) The new design blue laser module operates on 2 pcs AAA alkaline batteries (included). Projects a brilliant sapphire blue laser beam and dot. Visible beam at night - dot only during daytime hours. Three (3) hours constant on operation. The Z-Bolt® Sapphire Presenter is the product of new design technologies and manufacturing efficiencies. 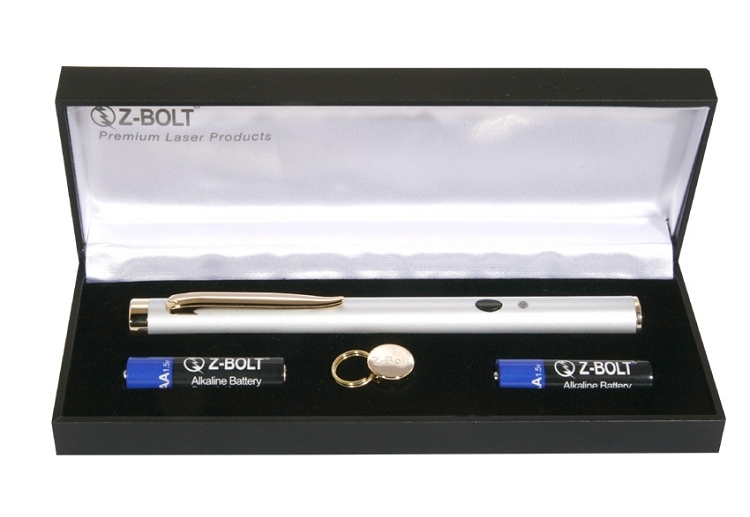 Z-Bolt® Sapphire Series laser pointers are fabricated with InGaN semiconductors, which emit blue laser light without frequency-doubling. Blue laser is eye safe - IEC Class 3R and FDA Class IIIa. 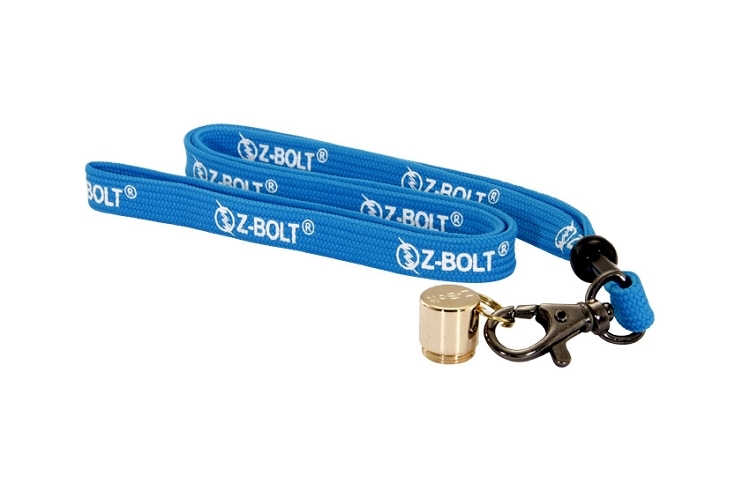 The BLP-5 ships in attractive satin lined travel & carry case with nylon blue Z-Bolt® lanyard and accessory lanyard loop end cap.